Be the first to share your favorite memory, photo or story of Wai. This memorial page is dedicated for family, friends and future generations to celebrate the life of their loved one. Wai King Chu was born on September 4th, 1928 in China to Yuen On Chu and Yuk Fong Yu. She died on April 1st, 2019 in Avantara Long Grove (Long Grove, IL). 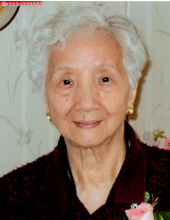 Mrs. Chu was co-owner of Jade Orient Restaurant and Hong Kong Restaurant in the 1980s, in the southwest side of Chicago. She loved to draw, read, sing, cook, garden, and knit. Wai loved to spend time with her family and was loved by all. She is survived by her children, Susan Chu (Wah Kim Wong) and Catherine Chu (Andrew Chan); daughter-in-law, Meei You Lee; grandchildren, Helen Leung (Nathan Au), Hoi Yin Leung (Mui), Joyce Ng, Lynna Chu, Ellick Chan (Monica Zhang), Sherwin Chan, and Willie Chan; great-grandchild (Ian Au); and many nieces and nephews. Wai was preceded into death by her husband, Chun Wang Chu, they were married March 10, 1948; sons, Kin Ping and Kin Wing; her parents, Yuen On Chu and Yuk Fong Yu; brother Wei Ju (Qiao Yi Wu). Visitation Thursday, April 4, 2019, from 3:00 pm until 7:00 pm at Glueckert Funeral Home, Ltd., 1520 North Arlington Heights Road, Arlington Heights, IL 60004. Interment service 11:00 am, Friday, April 6, 2019, at Mt. Auburn Cemetery, 4101 South Oak Park Avenue, Stickney, IL 60402. Funeral Service private. "Email Address" would like to share the life celebration of Wai King Chu. Click on the "link" to go to share a favorite memory or leave a condolence message for the family.